July 5, 2011 - The Federal Aviation Administration (FAA) and the National Air Traffic Controllers Association (NATCA) announced agreement (PDF) on important fatigue recommendations that were developed by a joint FAA-NATCA working group which was established under the 2009 collective bargaining agreement. "The American public must have confidence that our nation's air traffic controllers are rested and ready to work," said Transportation Secretary Ray LaHood. "We have the safest air transportation system in the world but we needed to make changes and we are doing that." The agreement reinforces existing FAA policy that prohibits air traffic controllers from sleeping while they are performing assigned duties. The FAA will continue to provide air traffic controllers breaks on the midnight shift based on staffing and workload. While on break, air traffic controllers are expected to conduct themselves professionally and be available for recall at all times. 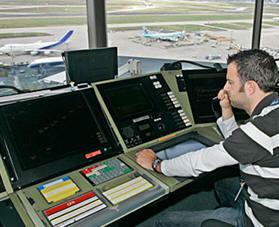 The FAA and NATCA also agreed that all air traffic controllers must report for work well-rested and mentally alert. It is the employee's responsibility to notify their supervisor if they are too fatigued to perform their air traffic control duties. As a result of this agreement, air traffic controllers can now request to take leave if they are too fatigued to work air traffic. This agreement marks the completion of the tasks required by this joint FAA-NATCA fatigue working group. The FAA and NATCA will continue to collaborate to reduce the risk of fatigue in the workplace. "Air traffic controllers have the responsibility to report rested and ready to work so they can safely perform their operational duties," said FAA Administrator Randy Babbitt. "But we also need to make sure we have the right policies in place to reduce the possibility of fatigue in the workplace." "We are pleased that the efforts of the joint NATCA-FAA fatigue workgroup that produced these science-based recommendations have resulted in an agreement and their implementation into the schedules and work environments of our nation's dedicated and highly professional air traffic controller workforce," said NATCA President Paul Rinaldi. "We supported the FAA's action to enhance aviation safety by eliminating single staffing on the midnight shift and we fully support these recommendations that address fatigue. They are common sense solutions to a safety problem that NATCA and fatigue experts have consistently raised for many years." Air traffic controllers will also now be allowed to listen to the radio and read appropriate printed material while on duty during the hours of 10PM and 6AM as traffic permits. The FAA had previously adjusted work schedules to give air traffic controllers a minimum of nine hours off between shifts. The FAA and NATCA will develop new watch schedule principles that incorporate fatigue science for schedules beginning no later than September 1, 2012. The FAA and NATCA are already beginning to work with local facilities on watch schedules that reduce the possibility of fatigue in the transition from the day shift to the midnight shift. The FAA has also agreed to develop policies that will encourage air traffic controllers to seek medical help for sleep apnea. Currently, air traffic controllers lose their medical qualification if they are diagnosed with sleep apnea. The FAA will work to develop a process for most air traffic controllers with sleep apnea to regain their medical qualification once they receive proper medical treatment. The FAA's Office of Aerospace Medicine will also develop educational material to raise awareness of the symptoms and the physical effects of sleep apnea. As a result of this agreement, the FAA will develop a Fatigue Risk Management System for air traffic operations by January of next year. This management system will be designed to collect and analyze data associated with work schedules, including work intensity, to ensure that the schedules are not increasing the possibility of fatigue. Systems like these are commonly used in other areas of aviation to evaluate levels of risk. The FAA is also designing a comprehensive fatigue awareness and education training program for employees.